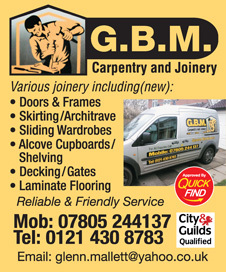 GBM Carpentry & Joinery are a Quick Find Directories checked and approved local business offering a friendly and reliable services for all your carpentry needs. Covering Shirley, Hall Green, Kings Heath, Moseley, Wythall, Earlswood, Tidbury Green and surrounding areas. "Great bespoke workmanship and always there when he says he will be. Have now used him on several jobs, routine and some bespoke stair and fitted wardrobe work. He's very reliable and meticulous. To top it off he cleans up after himself!" "Good work, professional, informative, nice guy. Thank you for your help"
"Just to let you know that we have received superb service from this company, excellent workmanship and relations!"